Cast iron is however becoming obsolete because wrought iron does everything better that is important in an iron pan. Yes, we know cast iron is also one piece, and has been around for centuries. But times change. Our wrought iron pans cook and season the same as cast iron, yet they are around half the weight of traditional cast iron pans. That's the main thing cast iron enthusiasts say about cast iron: big steaks don't cool the pan so fast that the sear (browning with Maillard reaction) is destroyed by temp drop to steam/stewing. Cast iron has worked fine for hundreds of years. The big one: wrought iron pans are around half the weight of cast iron pans. The low wrought iron weight also really suits very young and older cooks, as well as cooks with strength challenges. Across the board, our pans aren't exactly half the weight of cast iron pans though it does depend on the size and make, our statement is a good average. Our smaller pans are slightly more than half the weight, our mid-sized pans are close to half the weight, and our large pans (coming later) are much less than half the weight of bigger brands such as Lodge. As our pans get bigger, our 3mm bases, and our thinner walls make an even bigger difference in reducing weight. There’s also lots of brands and styles, so our ‘half weight’ is a good average for average pan sizes for average brands. Despite being around half the weight of cast iron, our pans are also tougher and will last much longer, because our wrought iron can’t be cracked. Even thick cast iron pans regularly crack with impact or thermal shock. New 'hipster' machined cast iron pans can be as light as 4lbs for a 10” pan, so only about 25% heavier than ours, but they’re also very fragile. Cast iron is already fragile for impact or thermal shock, and machining them thin makes them even more fragile. At some point there will be an accident…..and that’s a shame when you think a pan is tough enough to hand down as a family heirloom. We see the sad stories often on cast iron cooking forums: "I'm devastated. Today I dropped my great grandmother's cast iron pan.....". That will never happen with our pans. Why is 1-piece technology important? We’re mechanical engineers who cook, we’ve been engineering chef equipment for decades, and Solidteknics used to make cast iron pans. Cast iron pans have been around for 2 centuries, and hand-forged iron pans have been around for 2 millenia. 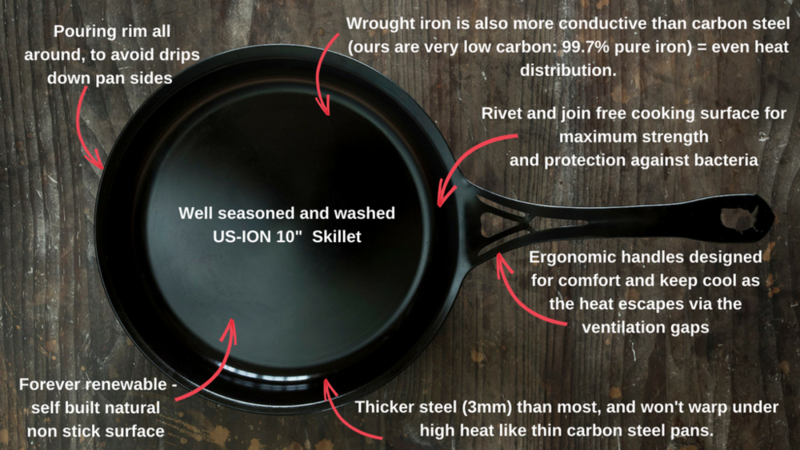 Therefore we are not the only 1-piece iron pan, but we are the world’s only manufacturer with a patented new method for making production seamless 1-piece wrought iron (and stainless) cookware. We love traditional cast iron too, in a nostalgic kind of way. Wrought iron performs the same at half the weight.